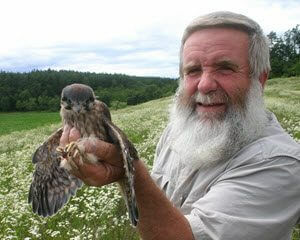 This presentation focuses on the Tom’s energetic crusade to rebuild the American Kestrel population in northeast Connecticut, from 2009 when he began, up through the 2016 breeding season. Tom’s presentation includes fascinating video clips of both nestlings and adult birds. Some of the topics covered are the possible reasons for the American Kestrel’s decline; which factors seem to influence the breeding success of the birds; what has been learned about successful nestbox placement; what we have learned from banding, radio telemetry, and geolocator studies with the birds; and the role of the European Starling in the breeding success of kestrels. Tom Sayers has spent much of his free time since the age of eight wandering the woods and fields, fascinated by the complexity and diversity of the natural world. In 2009, his life-long interest in birds led him to experiment with putting up five American Kestrel nestboxes in northeast Connecticut as a way of trying to help reverse the dramatic decline of the threatened American Kestrel. Those first boxes produced seven nestlings in the first year and resulted in the formation of the Northeast Connecticut Kestrel Project (www.nectkestrels.com).